We are delighted to announce that Tony Wilmott is the winner of this year’s prestigious Archaeologist of the Year award. Currently Senior Archaeologist for English Heritage, Tony Wilmott is one of the leading authorities on Hadrian’s Wall and the amphitheatres of Roman Britain. Specialising in the Roman and Medieval periods, he has recently excavated at Birdoswald, Chester and Richborough. His work at Maryport, where he was site director, shed new light on the magnificent set of altars dedicated to the god Jupiter found there, and was reported in CA 259. 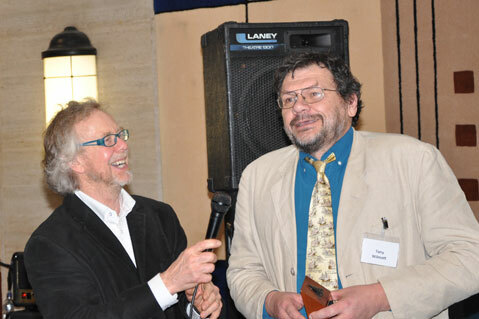 Tony is also a member of the Institute for Archaeologists and Fellow of the Society of Antiquaries. ‘Thank you for nominating me — it was a bright spot at the end of a very difficult year during which English Heritage had funding cut by 32%. I’m accepting it on behalf of all people working in public service archaeology. A former soldier who was inspired by the archaeological sites he saw while posted in Arabia, Martin Carver’s fate was sealed when he became hooked on reading Antiquity — the journal which he now edits. After spending almost 4 decades in the field, Martin has worked on sites from early Medieval towns (1975-1985) to Sutton Hoo (1983-2005) to Portmahomack’s Pictish monastery (1996-2007). He became the first secretary of the newly-formed Institute of Field Archaeologists in 1982, Professor of Archaeology at York University (where he was head of department for the next 10 years) in 1986, and was Vice-President of the Society of Antiquaries between 2002 and 2007. Currently Director of the Council for British Archaeology, Mike Heyworth’s interest in excavating began when he took part in a weekend dig at Old Down Farm, near Andover, aged 14. He joined the CBA over 20 years ago, working on the British and Irish Bibliography Service, and subsequently became the institution’s first ever Information Officer. Today Mike is not only in charge of strategic objectives at the CBA, but is also a trustee of Heritage Link, chair of the Archaeology Training Forum and Secretary to the All Party Parliamentary Archaeology Group. Tony is a fine “young archaeologist,comparable with members of the old school,an absolute pleasure to work with,& totally deserving of the Award. Mike Heyworth has played a crucial role in the recent defence of planning-based archaeology in Britain, as it comes under increasing pressure, and is made increasingly vulnerable by Tory -led cuts to local authority budgets, reductionds in support to English Heritage,and by inadequacies in the Draft National Planning Policy Framework. In particular, his clear and coherent media countering of the arguement against archaeology as a material consideration in local planning, made by Cllr Alan Melton (Fenland District Council, Cambs.) in 2011 is, in itself, deserving of this award. Tony Wilmott for his excavations at Richborough, Kent and his subsequent public talk to the public and to Society members who helped with pot washing etc., despite being very busy up at Hadrian’s Wall. I vote for Indiana Jones.